MMC Replay is completely sold out. It is still unsure whether there will be another batch of MMCRs. The manufacturer is currently concentrating on the new Chameleon cartridge. However, a remaining stock of the Retro Replay freezer cartridge is available again (limited stock!). 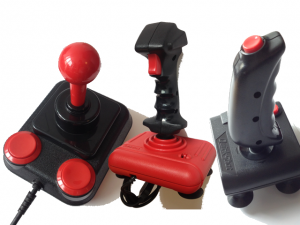 The Competition Pro Joystick can be obtained again as well, either as single joystick(s), or in form of the limited Competition Pro 4 Player Bundle: 4 Competition Pro joysticks and one 4 Player Interface at a reduced price. The ethernet card RR-Net is on stock again, too. Did you know? RR-Net and MP3@64 also fit on the new IDE64, available from http://www.ide64.org/. Last but not least, Cartridge Cases are also available in yellow now!